Over the last few days, I’ve been on the hunt for a good unlimited , free translation API. I’ve stumbled upon Glosbe.com, which does not require an API key, although they do mention it may be limited by request per IP to prevent abuse, and I’ll test that out on Monday. So, the first step is to go to http://api.yandex.com/translate/ and sign up for a Yandex Passport, and get an API key. A quirk I noticed when doing this as a console app, was that the console could not write our Cyrillic characters. There is a way around this by using the Windows API, but I just used a MessageBox. 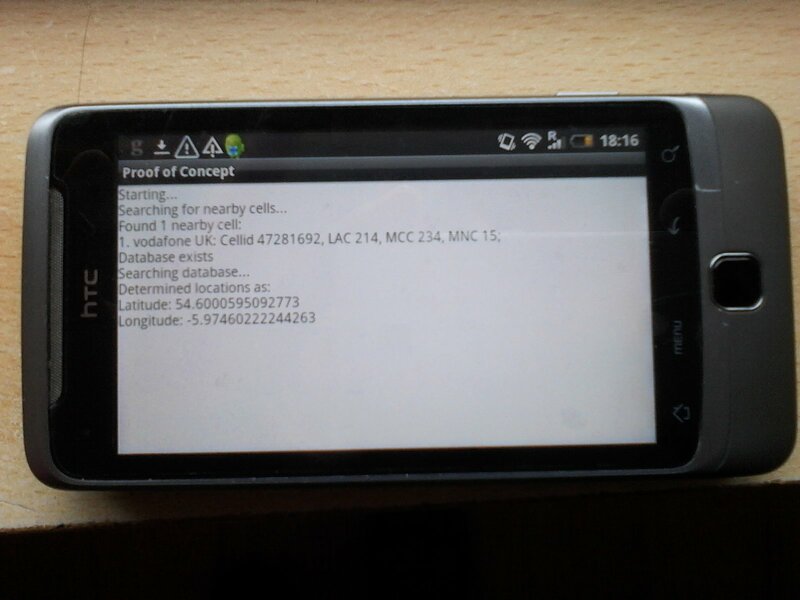 Offline Geolocation is an Android Library that can be used to determine the location of an Android phone when both GPS positioning and an Internet connection are unavailable. This project is completely open source, you can download the source code for the Android App, and import it into your eclipse workspace. All we ask is that you tell us who you are and what you plan to do with the code before downloading it. You can then use the code freely, without any license restrictions, although we’d love it if you can give us credit in your final product. How this App works, is it detects nearby cell towers, and compares the cell id, MCC, MNC and LAC codes against a SQLLite database of over 2 million known cell towers worldwide. It is designed to give you the best answer it can, although, the data is not exhaustive. This data will never be as accurate as GPS or Online Geolocation, but it serves as a good failover, whenever an Internet connection is unavailable. OAUTH is an authentication system used by companies such as Google, Twitter, Vimeo, Linked in etc, and it is much more complex than basic authentication, but it really is just about exchanging data between your server and the authentication provider. This is meant to be a “Hello World” example, showing an easy way to implement OAuth 2, without using any third party frameworks. The example uses C# (ASPX), and Google API. I will be demonstrating a call to Google Analytics API, but any Google API works similarly. I can’t say the same for Twitter / Vimeo / LinkedIn, but the flow of data should be the same. The reason why OAuth is popular, is because it means that API consumers (i.e. you), don’t get to see user’s Google credentials. You never ask the user for their username and password, you send them to Google and Google enter their username and password on Google’s page. Google will then send you back “proof” that the username and password were correct, but will never tell you what the username and password was. redirect_uri – You set this in your Google API, and it tells Google where to send the user after they have logged in. scope – This sets which APIs you would like to use, In my case, Google Analytics. Once the user signs into Google, then it’s up to some server-side code to interpret the response from Google, and use it to access Google’s APIs using the user’s credentials. This is where the callback script comes in, which is simply an ASPX page that is hosted on your server. 2. Use the access token when calling Google’s API methods. Let’s deal with the first step, the exchange of the authorisation code. And there you have it, we’ve successfully used OAuth to authenticate a user against a Google API. BAR files are the format for apps for the BlackBerry QNX range of devices (Z10, Q10, Playbook), it is basically a zip file, with a particular format. This is what you can see if you unzip a BAR file. This particular app is a BlackBerry Webworks / PhoneGap app. Normally, I write Android apps using PhoneGap / Cordova, but I wanted to start looking into native apps, to tap into features such as SQLLite etc. So, Here’s a first go at “Say Hello World”, an app with a button that pops up a toast saying “Hello World”. PGWhitelist was not initialized properly, all urls will be disallowed. This was because the PhoneGap.plist file was from the previous version of PhoneGap, and didn’t have all the required keys.